This blog post is primarily about a particularly poor suggested design for London. Click here for a particularly good design for turning across traffic, here for an example of a dangerous design, here for a selection of good junction designs. Yesterday evening, this week's Study Tour group, a mix of campaigners and planners from Australia, Britain, Canada and the USA, ate their evening meal with us at a nice restaurant in Groningen which happens to overlook the most dangerous junction in the whole of The Netherlands. Is this the world's first cycle junction design to accommodate the needs of those people who are not "ambiturners" ? This junction design not only includes the appalling right turn design but also on-road cycle-lanes and advanced stop lines. These are also examples of old-fashioned and dangerous provision. Astonishingly, people actually get paid for this standard of work. If you're a Londoner it comes out of your taxes. I've criticized two stage turns before because even if done well, they're hardly optimal to encourage cycling. Not only do they keep cyclists on the road, but they extend the amount of time that a cyclist spends in the junction area. Quite apart from any physical danger, this is certainly not good for subjective safety. A two stage turn is an admission of not knowing how to deal with cyclists. It results in delays, it's difficult with a cargo bike, when carrying children or towing a trailer to spin on the spot and enter the correct position to make the turn. If you're an older person or have a disability then the problems will be even greater. This design is particularly illogical, quite the reverse of the self-explaining streets which the Dutch strive for. It will not be easy for people, especially children, to understand so it will be used in ways the designer did not intend. I've also criticized Advanced Stop Lines (bike boxes) before because these also cause conflict. A cyclist trying to position themselves correctly to make a right turn in such a box is required to ride across other lanes of traffic. The TfL designer actually expects this to happen as they've planned in an ASL which is in the middle of the road for right turns. This would not be required if they had designed the junction properly in the first place so that there was no advantage to cyclists from riding in front of buses. "Being aware of each other" is not infrastructure, it's an accident waiting to happen. Crashes occur when people are not paying attention and it is the function of correctly designed infrastructure to be forgiving of mistakes, not to rely on people behaving perfectly in order to be safe. Questions for the designer: Who is the target audience for this ? Who is it that requested their journeys be made longer and less convenient and who wanted to spend more of their time when cycling around junctions with motor vehicles ? Do you really expect that someone will ride that extra distance to position themselves in your secondary waiting area if they're running late ? No-one should have to choose between "safe" and "convenient". This design forces people to have to make a "devil's bargain" when good infrastructure doesn't force that choice to be made. Would you let a five year old ride across this junction ? Would you even let a teenager ride unaccompanied here ? If not, why not ? Is it not easy enough to understand ? Can errors easily be made ? These are admissions that the junction is not sustainably safe. Accidents will happen and injuries and deaths are likely to result from the building of infrastructure like this. According to the description on TfL's youtube channel, this is going to be reality in London as of October 2013. It is to be part of London's "superhighway" network. Frankly, it's amazing that someone can do work of this quality, that they can pass it to their boss, it gets approval to be built, people can make promotional videos of it and the promotion department can let people know about it, and all of the people involved should have been paid for their efforts without anyone noticing how dreadful it is. Transport For London, is this really the best you can do ? Do you honestly imagine that this will enable you to catch up with The Netherlands ? What should they have done ? The most advanced treatment of a traffic light junction in the Netherlands now is the Simultaneous Green junction. These junctions remove all conflict in both space and time. No-one has to find their way to the front of a queue of motor vehicles. No-one has to wait twice to make one turn. Everyone gets to take the most direct route across the junction, no matter what their skill level and without any risk of being run over. Children can ride safely across because it is obvious how to ride safely across such a junction. It's even possible to incorporate right turn on red for cyclists only and to make the phases of the lights such that cyclists' average delays are half that of motorists. There is a lot of inbuilt flexibility in Simultaneous Green junctions. Yesterday, hours before dinner and hours before I'd seen TfL's video, our Study Tour group rode over this simultaneous green junction in Groningen. It's somewhat larger than the junction that TfL are planning for but extremely convenient and easy to use. Because no-one from TfL was in the Study Tour group, no-one from TfL saw this far superior and proven design of junction for themselves. 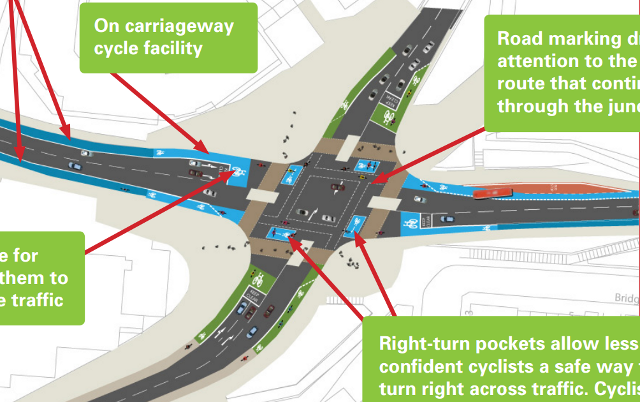 What's more, this design already exists and is proven at many different sizes of junction, from joining tiny roads (in Assen there's an example which has just one lane of motor traffic and a contra-flow cycle-lane) right up to junctions larger than that which TfL are dealing with, several lanes in each direction. road car parking. It still works well. In all cases, Simultaneous Green junctions are both convenient and safe for everyone to use. No-one is encouraged to choose a less safe route across the junction if they're in a hurry. Before wasting money on doing the wrong thing, why didn't TfL send people over here to find out what real cycling infrastructure was, so that they were equipped to do a better job than they have ? Complete with the three dangerous features of a bad bus stop design, on-road cycle-lanes and advanced stop-lines as well as supporting "less confident" cyclists in a different and less convenient way than those who are "more confident", this junction design which Southampton claims is "Dutch" is actually absolutely nothing like real Dutch infrastructure. Why do British councils take tax-payers' money and use it to pay people who do such shoddy work as this ? 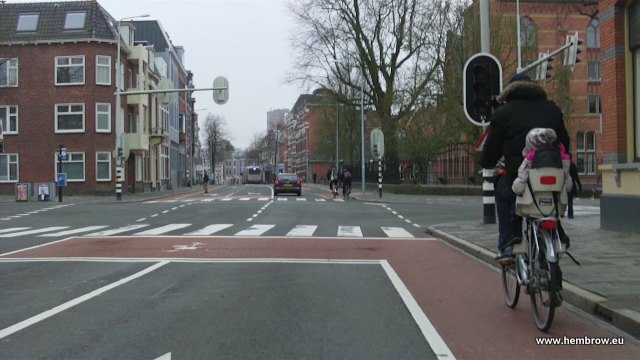 Again, this would be far superior, far safer and more convenient for cyclists and also far more representative of real Dutch infrastructure if it had been designed as a simultaneous green junction. Southampton, the design which you are considering is not "Dutch". You are being sold a copy of a type of junction which kills cyclists in Denmark. Please consider sending your planners on a Study Tour to find out about better solutions than this. Send them to find out what really is built in The Netherlands, how and why it works, so that you can apply the same principles in your city. We demonstrate real Dutch cycling infrastructure over three days, showing some of the very best examples as well as demonstrating why the less good infrastructure should not be emulated. Let us help you to avoid the costly mistake of building infrastructure which causes the conflict, danger and inconvenience which you have designed into the Itchen Bridge junction. 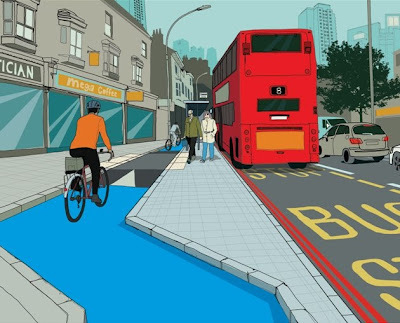 I've just found out that London Cycling Campaign actually approve of the ridiculous design shown at the top of this page for Stratford High Road. In fact, they're taking credit for it. This is one of two things they describe as "solutions proposed by our Love London, Go Dutch campaign" (note that in response to this criticism they changed their web page at this link to say that it's a "poor implementation", but the headline remains as positive as before and comments under the blog post still refer to their enthusiasm). Londoners, you've got to seriously think about this. You are represented by a campaigning organisation which sees "Love London, Go Dutch" as merely a slogan and nothing to do with actual Dutch infrastructure. Sadly, this has been obvious from the very start of their "campaign" when they admitted that one of their "Dutch" ideas was not Dutch at all and that they'd actually made up something they thought of as a "hybrid" of ideas from several countries but which actually doesn't appear in any other country. I covered this a couple of weeks ago. Another piece of infrastructure design which LCC are taking credit for is the inadequately designed bus stop bypass further along the same route (CS2). While LCC claim that there are "literally thousands of these in the Netherlands", that's simply not true. There are indeed thousands of bus stop bypasses over here, but they don't look like the one on CS2 - they're engineered to a far higher standard. So long as the LCC continues to have such low aspirations for London, they will continue to be a part of the problem regarding cycling in the UK rather than being part of the solution. I have invited people from London Cycling Campaign to join us on one of our Study Tours so that they can see and use real Dutch cycling infrastructure and have it explained to them. Thus far, they have declined the offer. It's disappointing to see that instead of admitting that they've made an error, the LCC continue to try to spin this issue. 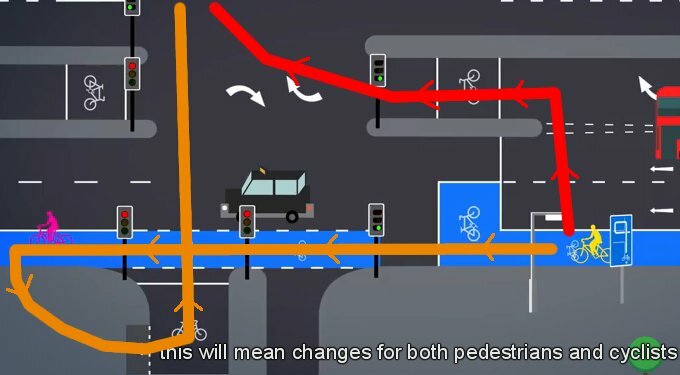 An LCC representative writes in a response to this blog post that "Well-designed two-stage right turns are approved of by both Dutch and Danish authorities and are common in Denmark". In fact, nothing remotely like the video from TfL above, which LCC says "could make cycling safer and more convenient" exists in The Netherlands. Remember that the campaigning position that LCC was forced by their membership to adopt was called "Love London, Go Dutch", not "Go Danish". This is not the first time that LCC has tried to confuse Dutch and Danish practice and their repetition of assertions like this one doesn't make them into facts. It's not good enough for LCC to appropriate the language of change (as has happened with subjective safety and Go Dutch) but to carry on as usual, continuing to promote second-best solutions in London. While this continues, LCC remains part of the problem rather than part of the solution. These things need to turn into real policy and real change not just slogans. I also note a comment made in the LCC response about not having been on our tours but going to "experts" instead. What LCC have actually turned down is the opportunity to take part in the only cycling study tours in this country run by people who speak English as a native language, who have lived and cycled in both the UK and the Netherlands and understand both countries and who are completely independent. We do not use the tours to sell the services of Dutch companies (note that employing a Dutch company is no guarantee that you'll get a Dutch quality of infrastructure). We demonstrate what does not work and why it does not work as well as showing those things which work very well. We don't give a false impression by visiting highlights but we aim to give an honest appraisal. We point out that not everything "Dutch" is worth copying, we don't rubber stamp anything and we won't be polite about bad ideas. Frankly, I find the attitude of the LCC quite puzzling. If they were genuinely interested in furthering cycling, they would have investigated all possible sources of information, and that includes us. But they did not. Some people in LCC value our work enough to have asked us to do unpaid work for the organisation. They've also been happy to use our photographs and videos for free. But their interest extends only so far as what they can take. Apart from that, LCC has not made any contact at all. We run our tours in order to try to educate people in organisations like LCC so that they can make better use of their funds and be more effective. Yes we do charge for the tours but this does not make us wealthy. In fact, we've barely done better than break even over the six years that we have operated study tours. That is as planned. This is not a self-serving exercise. Thankless as it often feels, this is something we invested a great deal of time and money into in order to try to make the world into a better place. When we've been able to afford to do so, we've even often offered free tours (i.e. at our cost) to people who thought would especially benefit. If LCC staff are going to try to slight us, then it's only fair to point out that an independent source pointed out a couple of years ago that "70% of its budget goes on staff salaries and that the search for more funding is seen as an important LCC goal". If anyone has their snout in the trough, I can assure readers that it's not us. We receive 0% of LCC's budget. 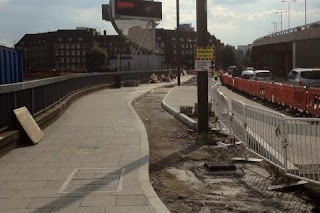 In November, LCC returned to praising the CS2 extension of which this junction is a part, claiming it to be "a major success for LCC" before turning around and criticizing it a couple of days later after there had been fatalities on CS2. This is not good enough. In case you're wondering, the most dangerous junction in the whole of the Netherlands is much less dangerous than several junctions in London. Nevertheless, this junction is an example of bad design and our study tours visit it because it is one of several places where we can demonstrate how conflicts are generated by bad design. TfL really would have benefited from this. Earlier today I wrote a blog post about how Londoners use cars for exactly the same journeys as the Dutch use bikes. However, there was more than just that in Transport for London's data and at least one thing which I thought much more important: How people behave when they have children. What happens when Londoners have children ? TfL say that "Car trip rates are consistently around 50 per cent higher amongst residents of households with at least one child than those living in childless households across all income bands. Averaged across all income bands, adults in households with children make 0.93 car driver trips a day on average, compared to 0.58 car driver trips per person in households without children." They go on to say that "Parents of pre-school and primary school aged children have the highest car driver trip rates, and young adult households by far the lowest car driver trip rates." It may be difficult for campaigners to see why, but this is evidence, as if we needed it, that Londoners care about their children. Being cocooned in a car is bad for children, but parents in London see see driving as the least bad option to try to keep their children safe. Parents across the world are united by a desire for their children to be safe. Every parent wants the best for their children, however while Dutch children benefit from an environment in which their parents can give them great freedom and which UNICEF says gives them the best wellbeing of any children, their British counterparts are rate second from bottom (only the USA is worse) in well-being, have less freedom than in the past and are cocooned in their parents' cars because of fear for their safety. This isn't only bad for the development of children but also for parents who have the added stress and expense of having to work as unpaid taxi drivers. Children across most of the world share the same problems of lack of independence and this is a large part of the reason for the obesity 'epidemic' which leads to many calls or action. Nearly half of Britain's children are not getting the bare minimum of daily exercise needed for good health. It's similar in many other countries. Sadly, the solutions proposed often do not include the idea of allowing children the freedom that they crave because people can't see how that can be achieved. I do not criticise parents in London or elsewhere because they want to keep their children safe. I also cannot criticise them for attempting to do so by driving them to their destinations in the family car rather than allowing their children to make their own way on a bicycle. Parents who do this are sacrificing their own time to benefit their children. Driving their children is an act of love. The harm caused to children as a result of this is not the result of decisions made by individual parents who have no choice but to react to their environment so much as it is the inevitable result of decades of road design which has made cycling and also walking less than desirable, even on many residential streets. In London the fault lies with Transport for London and the buck stops with Boris Johnson, the Mayor of London, who for all his flannel about cycling has done almost nothing at all to make it possible for the majority of the population, and particularly for children, to travel independently instead of having to rely on their parents. Events on closed roads demonstrate how popular cycling could be in London if only people felt safe to ride their bikes. But people do not feel safe and they will not cycle until they do. The standard of infrastructure in London is so poor than even most adults do not cycle now. Just 2% of journeys are by bike. In order for children to be able to cycle, the infrastructure needs to be far better as not only do The degree of subjective safety required to encourage parents to allow their children to have freedom. A month has now passed since we invited Boris Johnson and other London politicians to come and see what it is that makes it possible for Dutch people to cycle as much as they do and to see for himself how Dutch children benefit from their freedom. Since we sent our invitation, Boris Johnson has got himself into the paper again, this time cycling in Australia. Australias has similar problems with childhood obesity and lack of children's independence and social development to those of the UK. But what good is this doing for Britain ? How does this help the children of London, the UK, or Australia for that matter ? Campaigners. It's time for effective action ! There's an opportunity for cycling campaigners if they wish to take it. Forget about ineffective campaigning for things like "space for cycling" (it may as well be "help the shoplifters" so far as the general public are concerned). Stop antagonizing people by talking about controversial but not particularly important issues like strict liability. Stop expending effort in debating the pros and cons of a single street in London which has been inadequately transformed for the second time. None of this is going to make cycling into an everyday experience for the whole population. By concentrating on these details you are missing the big picture. this blog. This is what "Go Dutch" should have been about! Sadly, that campaign in London was derailed from the start. Campaigners are partly to blame for the UK's disastrous last forty years because they've consistently failed to focus on the issues that really matter and have instead concentrated only on what existing cyclists needed to continue as a minority. Partly as a result of this emphasis, cyclists certainly are a minority now. 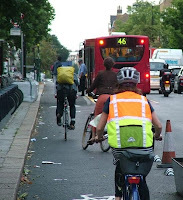 By allowing themselves to be pigeon-holed as "the cyclists", and by setting their own standards so low, campaigners made it easier for government to get away with decades of under-investment in cycling infrastructure which could have benefited everyone. Slowly, but oh so surely, the policies of successive governments have led to Britain's parents believing they have no choice but to transport their children by car. Parents want only the best for their children, but their choices are limited by the environment. This is why both walking and cycling to school have declined while driving to school has risen. Parents are doing the best they can for their children, but while they keep their children safe from being killed in collisions on the streets by transporting them by car, those same cars will still kill them just as surely if they lead to a sedentary lifestyle and the resulting health issues. This is your "Stop The Child Murder" moment. The best issue to campaign on now in the UK is the same issue as the Dutch campaigned on forty years ago: The safety and health of all the nation's children. A good slogan is needed for a campaign which is focused around children. "Stop The Child Murder" worked because it was emotive and was something that the whole population could get behind. The Campaign for Childhood Freedom also seeks the widest possible support. 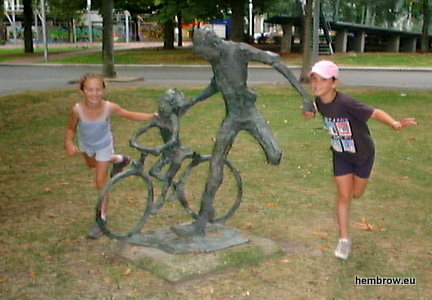 The health of future generations is vitally important, everyday exercise is vital to improving the health of children, and the best way of achieving this is to make it possible for every child to be active in their daily life and have a degree of freedom and independence similar to that which Dutch children benefit from. For how many adults is the memory of their first bicycle also a memory of the freedom and independence which it provided ? Children don't have driving licenses. If they are not to be cocooned in motor vehicles then there is a choice of travelling no further than walking distance or of experiencing the vastly greater degree of freedom which a bicycle provides. To enable today's children to have the same experiences as their parents and grandparents requires a change to the infrastructure so that they are safe. Cycling infrastructure must be of a quality that you would let a five year old use it and it must go everywhere. Not only to school, but to beaches, parks, city centres and anywhere else that children might want to go. Infrastructure of the quality required truly to enable children to cycle in safety works best for everyone. That includes older people who mostly don't cycle at all in other countries and those who like to ride at speed. Read more about what the freedom of Dutch children, the problems facing British children or my previous posts about campaigning for children. Also see how Dutch children get to school. Whatever you might think about the merits of campaigning for children, they're the only possible source of tomorrow's adult cyclists. Infrastructure which is good enough that parents find it safe for their children is good enough for confident and fast adult cyclists as well. We all have the same need for direct, convenient routes and safety. The Netherlands has been easily the most successful nation at encouraging cycling. See examples of what works well in The Netherlands and consider taking a study tour to learn more. 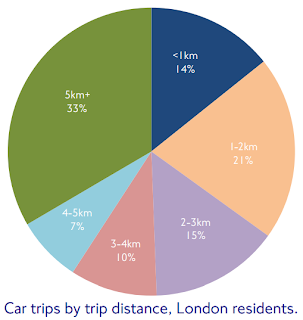 Interesting figures from Transport for London about journeys by car, their lengths and purposes. Londoners use cars for a wide range of journey distances, but most of the journeys that London residents make, just like most journeys made in other places in the world, are short. 2/3rds of the journeys that Londoners make by car are under 5 km (3 miles) in length. Half of these car journeys are less than 3 km (2 miles) in length and a third of the total are under 2 km (1.25 miles) in length. Clearly Londoners don't use cars just because they have long distances to travel. They use cars because they find them to be a convenient and safe way to make their journeys. It turns out that Londoners use cars in much the same way as the Dutch people use bicycles. TfL says that "on an average day, the typical London resident aged 16+ makes 0.73 trips per day by car as a driver and 0.23 trips per day as a passenger". This is not far off the average 0.8 trips per day by bicycle by the Dutch (top cities in The Netherlands have up to 1.4 trips per day by bike). 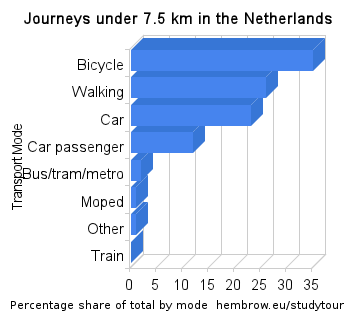 Figures for the whole of The Netherlands for all journey types. Source: Fietsberaad "Cycling in The Netherlands"
If Londoners use their cars for journeys which the Dutch would make by bike, and the distances covered by Londoners are no greater than the distances covered by the Dutch by bike, why is it that Londoners don't cycle instead of drive for those short journeys ? Why are only 2% of journeys in London by bicycle ? I think we all know the answer by now. Cycling in heavy traffic on roads which even now continue to be designed primarily to benefit motorists over cyclists is simply not for everyone. When roads are closed for events so that people can ride without the low subjective safety which results from "sharing" with motor vehicles, tens of thousands of people turn up to ride bikes. Most people will not take part in something that feels like an extreme sport just to pick up shopping. They just want to get to their destination and back again as easily as possible. Rather than expecting people to cycle despite conditions, a second revolution on Dutch streets in the 20th century removed motor vehicles and enabled comfortable and convenient cycling. TfL link courtesy of the Cycling Embassy of Great Britain. 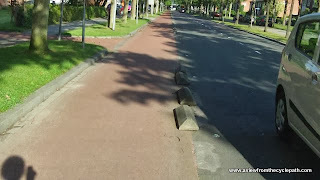 I've been interested in the use of bollards on Dutch cycle facilities for a long time. They stand out to cycling visitors to this country as there are thousands of these bollards and they're almost always installed in order to demarcate places for cycling from those for driving. Bollards provide the least expensive way to begin to unravel routes for motor vehicles from those for cycles. Bollards offer one of the simplest and most effective cycling measures. But it must be remembered that there is no single technique which works everywhere. Doing this is a first step applicable in some places but you need to also do all the other effective things to achieve a high cycling modal share. calmed in a village, with bike bypass. 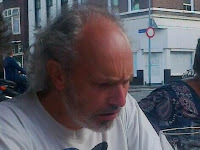 During the September 2011 Study Tour, one of the participants, Kevin Hickman, proposed a game. He mused that fifty bollards at around €100 each would not be a very large investment for any city or district but if installed correctly they could result in a substantial improvement for cycling. The "game" proposed is to be played by cycle-campaigners assuming they have fifty bollards at their disposal and working out where they would be best placed to improve conditions for cycling in their area. This is an interesting idea which can lead into positive campaigning and I've been meaning to write about it for nearly two years now, however I held back because I knew bollards are not entirely positive. They are used extensively in the Netherlands, but there are limits and bollards are sometimes unpopular because they can cause problems. More on that later. in 2007. Direct by bike, not by car. There are sometimes rather fanciful notions floated about how Dutch drivers behave markedly differently to drivers in other countries. In fact, just as people everywhere are much the same, drivers everywhere are much the same. This should come as no surprise as while some cycling campaigners may appear to forget it sometimes, drivers actually are people. Cycle-paths are sufficiently attractive that The Netherlands has no need to use physical barriers to prevent cyclists from wanting to use roads, but sometimes bollards are required to prevent drivers from using cycle-facilities or cycle-only through roads as short-cuts. Bollards appear primarily where cycling routes meet driving routes. They're also used to prevent minor roads from being used for through journeys (segregating modes without a cycle-path and helping to unravel driving routes from cycling routes) and in other places, for example to discourage parking of cars where they are not wanted. It is not completely unknown, but it is rare that bollards on cycle-paths in the Netherlands cause cyclists to have to slow down. They are used to keep motor vehicles away, not to make cycling inconvenient. The distance between bollards should never be less than one metre. This is required so that cyclists with disabilities can go everywhere that the able bodied can and it results in tricycles, trailers and bicycles heavily laden with bulging panniers being able to pass easily between barriers. Very narrow street in Zwolle. 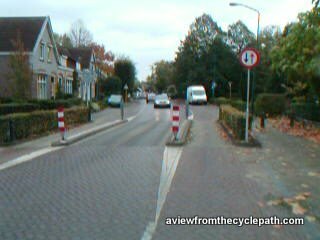 Perhaps a road like this would be considered to have "no room for cycle-paths" elsewhere, but in the Neherlands it's made into a no-go zone for motor vehicles. Black bollards are not ideal. New wide cycle-path in Zwolle. Motorists kept off by bollard also used to divide the two lanes on the cycle-path and to provide a very obvious indication of where the junction is. Bikes have priority at this crossing. This is safe only with careful design. Note how the cycle-path surface is continuous while the road surface is broken. Bridge in new suburb of Assen. Bikes have enhanced permeability over cars, and as a result, cyclists have shorter journeys than drivers. This makes cycling more attractive than driving. Industrial area in Assen. 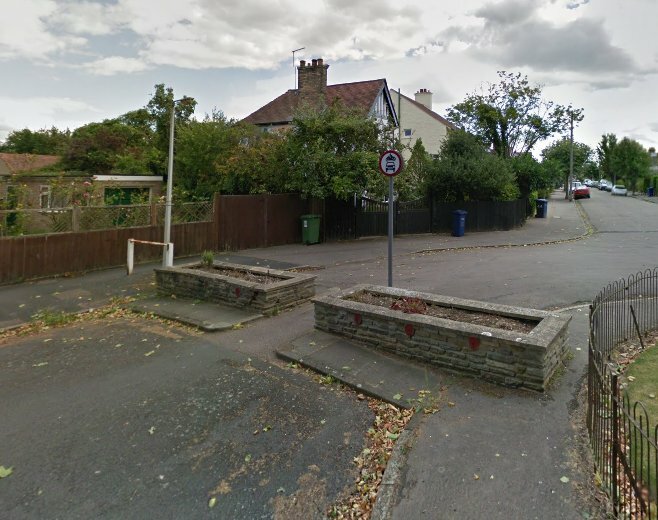 A single bollard motorists from using the cycle-path as a short-cut or making a u-turn in this location. 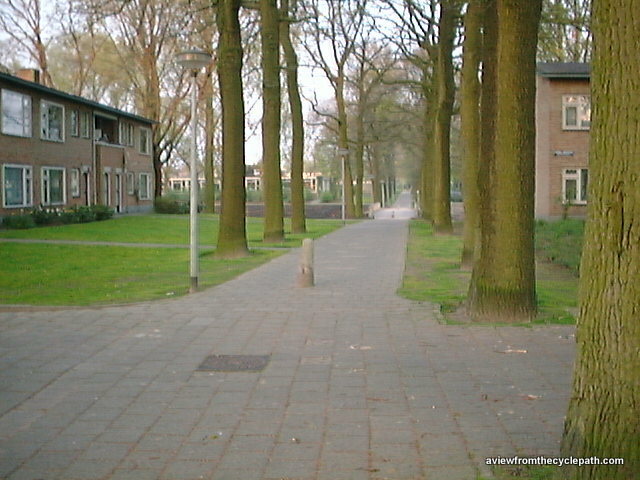 1970s residential area in Assen. Bollards used either side of a crossing between cycle-path and road to prevent drivers using the more direct route available by bike. This is analogous to the example above with the bridge in the new suburb. The same policies have been successfully applied for decades. Decades ago this was a quiet road through the countryside. 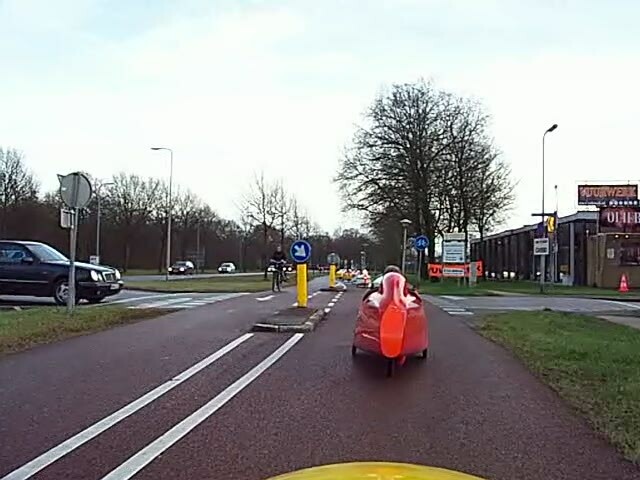 It would now be used by drivers if not for the use of bollards to transform it into a very attractive cycling only route through Assen where cyclists again gain an advantage of more direct journeys and shorter distances. To get from there to here in this residential area by car involves a considerable detour. Shorter routes make cycling more attractive, whatever your age. Not actually bollards but a good example from Cambridge. A rat-run was eliminated, transforming residential streets to be relatively quiet for their residents and making a good through route by bike. The city needs more of this. I tried to encourage residents of the road where we lived to ask for the same treatment but they preferred being able to drive in both directions over quiet and safety for their children. The use of planters only really makes sense if they will be maintained properly. Many bad examples result from misguided attempts to exclude mopeds from cycle-paths. In these cases the cure is very often worse than the disease. 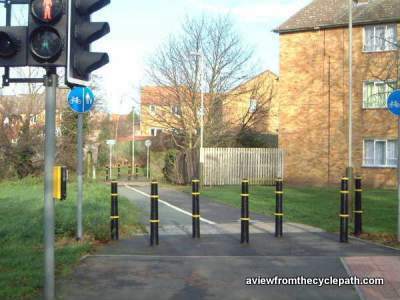 "Invisible" bollards or bollards placed so close together that they impede cycling or hidden around a corner so that they provide an unpleasant surprise for cyclists are also not good infrastructure. Almost invisible concrete post in the middle of a cycle-path in Eindhoven, probably totally invisible after dark. I took this photo in 2001 so it is very likely that this has been changed. Industrial area in Assen. Bollards used as a traffic calming pinch point to slow large vehicles and provide a bicycle bypass but because they do so by diverting trucks into the space occupied by bikes this could be dangerous. Because it's a non-through route industrial area and there is not much traffic here this is probably not a great problem, but this is not something which would work well on a street with lots of motor vehicles and lots of bicycles. These bollards in Cambridge prevent motorists from using a useful cut-through accessible by bike, but they are also impossible to use with a trailer behind a bicycle. The black paint does nothing to make them more visible at night. The other end of the same cut-through. It's an official cycle-route, so why has it been made so difficult to access by bike ? The black paint makes these obstructions difficult to see under some conditions, the triangular arms of these bollards are almost invisible at speed and the gap between them is extremely narrow. The potential for injury here is very high indeed. Narrow bicycle bridge in Cambridge. After riding downhill and picking up speed, you have to stop and dismount to negotiate these barriers, which may well catch you by surprise because they're not easy to see. First your brakes had better work well, but if you're riding a three wheeler, pulling a trailer or have a disability you'll have problems getting through here under any circumstances. These obstructions perform no useful purpose. Bicycle/foot bridge in Cambridge. After picking up speed downhill, these three bollards are clustered behind a blind corner. Because this bridge is already very narrow, only slightly over 2 m wide in total, such a dangerous obstruction is not required to prevent motorists from using it so it's not clear what problem these three bollards are supposed to solve. Conflict between cyclists and pedestrians is increased because the straightest line possible for a cyclist riding at speed is to use the pedestrian side of the path. Danger of losing control is increased by the British practice of installing textured paving the wrong way around on the cycling side of the path. The other end of the same bridge has the same problem. Another three closely clustered bollards which serve no useful purpose. Excessive bollards in the middle of the cycle-half of a not very wide, not very long and strangely designed path in Cambridge. These help to ensure that motorists have priority at the entrance to a primary school. Schools for children too young to drive cars should not be designed around cars, they should be designed to encourage a high level of independence amongst the children who attend the school. Cycling England was a government (under)funded organisation which promoted cycling in the UK between 2005 and 2011. I wrote about their unfortunate demise. Sadly, CE set their standards far too low. This photo was actually on their website as a "good" example of infrastructure. The "good" aspect of it was that the bollards are offset so that cyclists who wriggle enough can get between the gaps. Very Slowly. This is not nearly good enough. This example has far too many bollards across a narrow path and good cycling infrastructure does not make cyclists slow down and wriggle. Quite apart from how much inconvenience it causes for someone who simply wants to get somewhere by bike, how well does this work with a trailer, for disabled people etc. ? What's wrong with bollards ? How are the problems being solved ? Local newspaper cutting from Assen. doesn't mean they can drive on them. Colliding with a rigid metal, wood or concrete bollard on a bicycle can cause serious injury or even death. This is a surprisingly common occurrence. Hundreds of injuries a year result from cyclists riding into bollards in The Netherlands. Though we have to recognize that this happens in a place where there are millions of cyclists and these cyclists are the safest anywhere in the world, we must in any case be very careful about recommending bollards and careful to apply them in a way that is not dangerous. This type of collision is over-represented in injuries to older people. These injuries have risen in recent years along with the rise in cycling amongst older people. Older people may not have such good eyesight and may not see the bollards so easily. When they fall, they are injured more easily. Another group of cyclists who are injured more frequently than average by bollards are faster cyclists who may simply not have enough reaction time if a bollard is not adequately visible due to vegetation or a blind corner. Dutch bollards are usually painted with red and white stripes which make them reasonably easy to see in daytime, but the small reflectors often fitted don't help all that much at night time. However they are painted, bollards remain quite small objects and it's impossible to make sure that people will always see them. Note who is shown using the cycle-path. It is normal for racing cyclists to use cycle-paths in The Netherlands because cycle-paths offer the same advantages of shorter distances and better safety for fast cyclists as they do for slow cyclists. In this case, both racers and retired people on electric bikes are shown using the cycle-path with the new bollards, these being the two groups most affected. on the cycle-path aren't entirely new. Six month long evaluations are currently taking place across the country with the aim of comparing different new designs of bollards. The aim of each is the same - reducing injury rates. As well as being flexible, the new bollards include such features as greater width, lighter colours to make them more visible and solar powered lighting for better visibility after dark. Trials are also using such things as changed design of paint on the cycle-path and textured surfaces to warn cyclists that they are approaching a bollard. If you were provided with fifty bollards, how could you use them in your location ? Are there residential streets which could better serve their residents and be better for through cycling if rat-running was stopped ? Do you have minor rural roads which need the same treatment ? Do you have places where motorists park their cars and cause problems ? 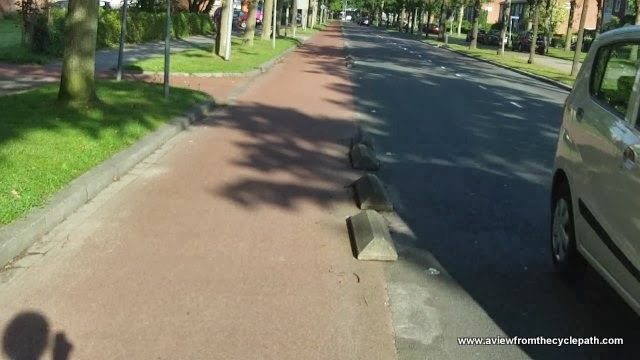 Any bollards to be used should be placed sparingly as creating obstructions for cyclists is not the aim and keep in mind the Dutch experience of how excess or badly placed bollards can easily result in injury. Also consider what bollards you would like to remove in your location ? Bear in mind that successful bollard usage requires that they are both visible and easy to pass. If you have clusters as shown in some of the bad examples above then the situation would almost certainly be improved by removing most of them. Arguments that cycling is "too expensive" to provide for do not really hold water. 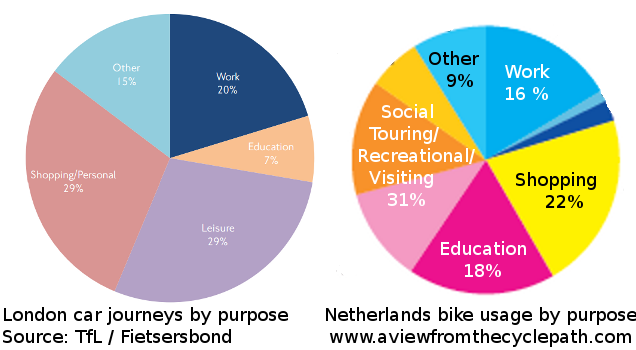 Cycling budgets are small compared with the budgets for other projects (including other transport projects) in every country, including The Netherlands. However the possibility of improving things for cycling relatively little expense is still attractive. It provides a chance for positive campaigning. A good first step can be achieved by using bollards and similar techniques to improve permeability for cycling vs. other modes. This is a good thing to do, but I have to emphasize that this is only one of several possible first steps and that having played this "game" the job is not done. Campaigners must not stop at this point because you need all the things that work in the Netherlands in order to get everyone to cycle as in The Netherlands. Campaigners and planners who have low aspirations can never achieve great ends. Join us on a study tour. 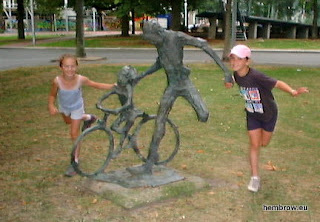 Neither this blog nor any other can show you all the details of what makes cycling so commonplace in The Netherlands. To begin to understand this you need to experience it, preferably with a guide. We have been learning about how and why cycling "works" in the Netherlands since last century and we've organised Cycling Infrastructure Study Tours since 2006. Take advantage of our many years of experience to reduce the time it takes for you to learn what you need to do beyond the first steps such as bollards. We can organise a tour on any date to suit your group. We also organise open tours each year to make the tours affordable for individuals who are not part of a group. Many hundreds of people have already learnt about Dutch cycling infrastructure by coming on our tours, take part yourself in order to find out about the other steps you need to take to transform your home into a place which approaches Dutch levels of liveability. Kennington People on Bikes wrote about problems due to bollards in London. You still want more ? Try the Bollards of London blog. 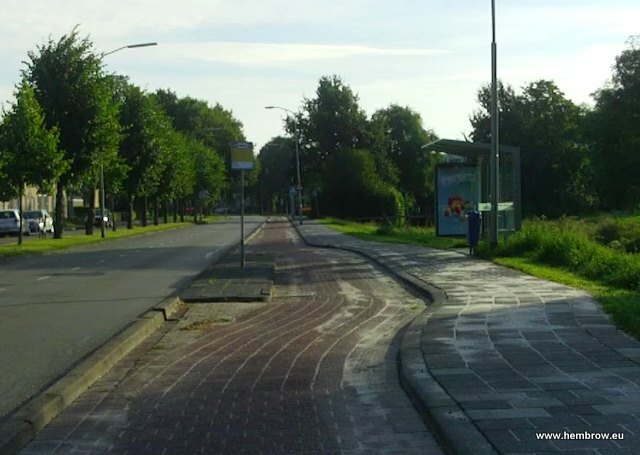 This video shows ten of the bus stop bypasses for bikes in Assen. They're not especially good "cherry picked" examples but simply the ten nearest my home. Most are alongside normal roads, one is alongside a bus road. All are within a couple of km and they were videoed in half an hour early last Friday morning. They're entirely typical of normal cycling infrastructure quality in this area. Note that these are all designed to be convenient for cyclists to use. They do not narrow or have raised sections to slow cyclists because cyclists are already slow compared with motor vehicles and we need to encourage efficient cycling not to slow cyclists down. Large and small vehicles can never "share" equally. In order to encourage true mass cycling, where the entire population uses a bicycle for a proportion of their journeys, conditions for riding must be subjectively safe. Where bicycles mix with motor vehicles, this feeling of safety is reduced. Where bicycles mix with large motor vehicles it is reduced further. Dutch bus-stop with no obvious bypass. this video to see how it works. Buses and bicycles should never be combined in one lane. This is not only because of the subjective safety issue, but also because the two modes move in fundamentally incompatible ways. Cyclists try to maintain a constant speed because this maximises efficiency (greater efficiency makes riding a bike being practical over a longer distance and reduces the time taken - further aided in the Netherlands by cycling routes being unravelled from motor routes and avoiding traffic lights). Buses, on the other hand, stop regularly to take up and let off passengers. Where bus and bicycle infrastructure is combined on a long road it often leads to leapfrogging as buses repeatedly overtake bikes and cyclists are given a choice either to wait behind the bus, wasting time and making cycling less attractive, or overtaking the bus while it is stopped, which can be dangerous for the cyclist. to stand before crossing the cycle-path. New-build doesn't look like this. 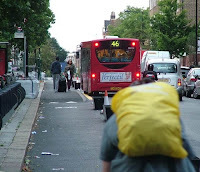 Bus passengers also clash with cyclists. If a cyclist tries to pass the bus on the "wrong" side between the stop and the bus then this puts cyclists directly into conflict with those who are boarding or alighting the bus. 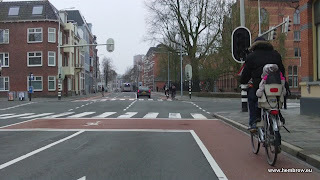 This is avoided in the Netherlands as shown in the video above, though you'll note that in the oldest example, pre-dating modern practice, cyclists are routed on the wrong side of the bus shelter which could cause conflict. 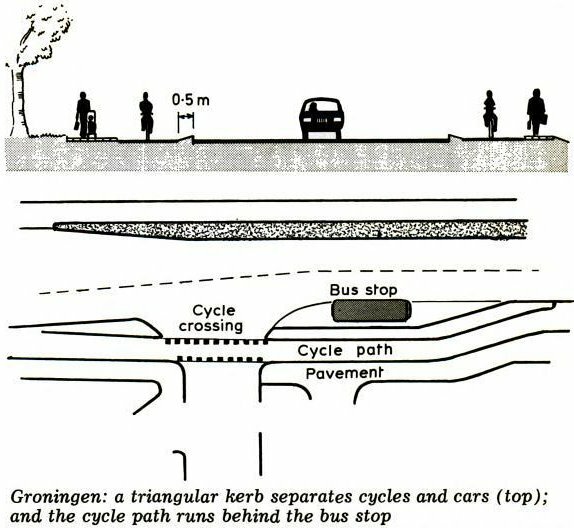 No modern bus stop would be designed like this, with conflict built in, but note that even in this example there is somewhere to stand after leaving the bus and before crossing the cycle-path. 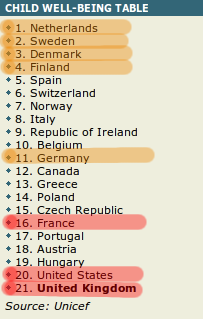 Why doesn't Britain copy the best examples ? New design for London. This will cause clash between cyclists and bus passengers. Why didn't they copy from best practice in NL ? New bus-stop for Royal College Street, London. It was obvious from the design that conflict should be expected here between cyclists and bus passengers because bikes are being routed between the bus and the bus stop without even a small place for bus passengers to stand between the bus that they're entering or leaving and the bicycle path with through traffic. 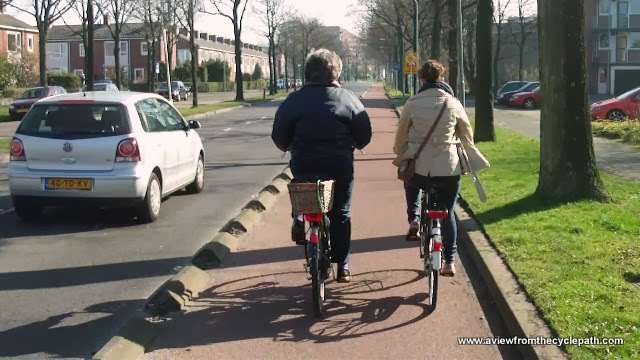 Also note that at just two metres wide, the bicycle lanes shown here are narrower than any of the examples in Assen. The high kerbs and the planters between the cycle-lanes and road reduce the safely usable width of the facility. Even the oldest example shown in my video from Assen is 2.3 m in width. That's on a relatively quiet residential access road and it is just one small weak link in a very dense grid of high quality cycling facilities within a small city. It deals with far fewer cyclists than could be the case in a larger city with fewer facilities. Another compromised design for London. Sharp bends on the cycle-path which is not wide enough. Opened several months after this blog post was written and immediately caused problems due to bad design. Why doesn't London copy best practice from the Netherlands ? 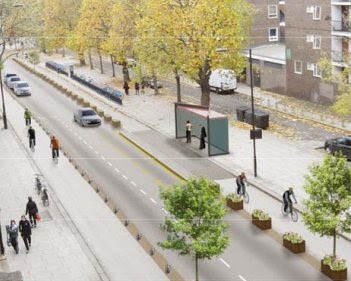 A second example from London is the proposal for extension of Cycling Superhighway 2 in London. This looks as shown in the brightly coloured illustration above. to be of usable width. From the picture it initially looked like this example could turn out better than Royal College Street as there is at least supposed to be somewhere for passengers to stand as they leave the bus. 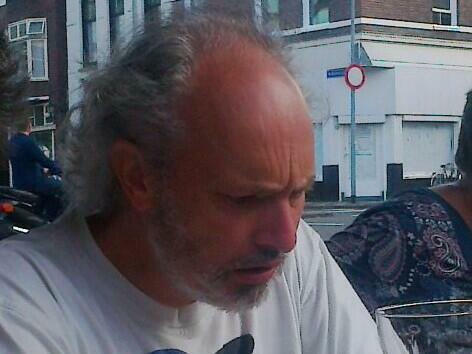 In that sense, it's similar to 30 year old Dutch designs. Similarity only goes skin deep, though, as the illustration shows an overly angular design and this could make it difficult to ride around easily, quickly and safely. There also appear to be dangerous high kerbs. It's not obvious why these kerbs are necessary at all, but they could at least be safe like these ones. 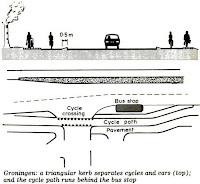 Lastly, the plans for this cycle-path again suggested it would be just two metres wide. It can be difficult to pass other cyclists safely within just two metres and if the route is well used this will be a problem. Given that "superhighways" in London are few and far between and that even with the low cycling modal share of London there is a huge population to draw cyclists from, this route probably will be well used. under construction. "barely 1 m wide"
Unfortunately, it's not actually been built even two metres wide. Mark Treasure tells me that it's "barely 1m wide at narrow point". A one metre wide cycle-path, with a post in it which narrows its effective width further, deep kerbs either side and passing a bus stop where bus passengers may or may not be aware of an approaching cyclist is very very far from best practice so far as bus stop bypasses are concerned. The idea of a bypass is to make cycling convenient. It should not cause cyclists to slow down or place them in danger. It should not cause conflict between cyclists and bus passengers. It should also not cause frustrated cyclists to use the road in order to bypass the bypass. London is "40 years behind" by choice not by accident. Even now, after supposedly having "gone Dutch", the city is still designing and building inferior infrastructure as seen in the two examples above. This simply isn't good enough. Why is London still not learning from the best examples ? Why is the city still trying to find its own novel ways to solve problems which were identified decades ago in the Netherlands and the solutions to which have since been refined to a very high standard ? Instead of continuing to make costly mistakes, why not send planners to find out what proper cycling infrastructure looks like ? An amusing blog post from The People's Cycling Front of South Gloucestershire reminded me of another idea for passing buses which has appeared in Scotland recently. The rightly much criticized "Nice Way Code" suggests that cyclists should never pass buses on the left and on the right only "if you must". 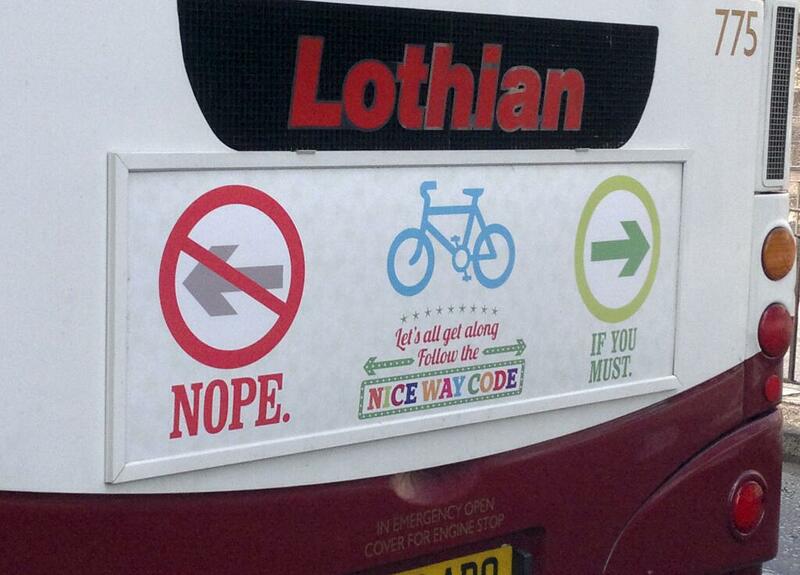 Sadly, the "Nice Way Code" campaign has consumed a considerable fraction of the not very generous funding for cycling in Scotland. Instead of making it easy for bikes to pass buses safely and without conflict, they're using cycling money to tell cyclists not to pass buses. This is just one of the many errors made by the "Nice Way Code", an organisation which sadly is backed by both CTC and Sustrans amongst other organisations who really should have known better. Campaigners need to campaign effectively. There is also excitement this morning about the British government having announced the "largest ever investment in cycling". This is apparently a figure of 77 million pounds to be spread amongst eight cities "in an effort to put Britain on a level footing with countries [...] such as [...] the Netherlands". Unfortunately, this sum of money isn't nearly enough to achieve that aim. The Netherlands spends roughly €30 per person per year, every year in order to improve the cycling infrastructure and continue to expand the network. The total funding available over the next two years is about £148 million and this will allow investment in just eight cities to be at around £10 per head for just two years. This low figure of £10 per head is the figure which CTC actually asked for a few months ago and it's also the figure which will be debated in parliament on the 2nd of September. Why is there so much complacency amongst campaigners ? Why such low ambitions ? Why do they offer support for inadequate policies and why do they not fight for what is really needed ? When you are already decades behind you cannot catch up by doing a third as much so why are campaigners putting their names to calls to do so little that the UK will inevitably remain in "dark ages" so far as cycling is concerned ? Low aspirations will not result in mass cycling and campaigners working with such aspirations are very much part of the reason why the UK is behind. The "armadillos" in Royal College Street are a failure. If we had been consulted we could have told TfL in advance that this would happen. It's not something you find often in the Netherlands because it doesn't really work. There are just a few old examples like that shown in the photo on the right. When copying from the Netherlands it's important to look for good examples. This is not a good example, it's one of those things that you should not copy. 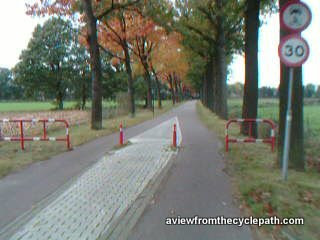 Probably the oldest cycle-path in Assen. It works OK in this location because it is alongside a residential area (apartment blocks) and there are very few vehicles turning across the cycle-path. But in time this will be replaced (it was supposed to have happened in 2010). The "Armadillos" shaken loose over the last few months by large vehicles which have been accessing a site on this road have been re-fitted and broken examples replaced. Much tidier now. You'll see from the photo that the cycle-path is generous enough that it doesn't feel cramped and also that cars pass at a reasonable distance. Nevertheless, this is outdated infrastructure. We were originally told there would be a proper cycle-path in this location by 2009. Each Assen concrete block "Armadillo" is 1 metre long, 25 cm wide and 12 cm tall. When some were loose, I tried picking one up. It was heavier than I thought I could lift without damaging my back. These are not the insubstantial plastic used elsewhere. Nevertheless, this is not adequate. Also see Hackney Cyclist for more and The Alternative Department for Transport for more about Royal College Street. This post was updated to include the words "floating bus stop" because this newly invented term has become commonly used to refer to bus stop bypasses.